Sweet basil is an important ingredient in Italian cooking but it is not the only type of of this herb available. There are 64 species, all native to the subtropics and tropics and are annuals, evergreen perennials and shrubs. They have a simple aromatic leaf and spikes of lipped flowers arranged in whorls. Basil requires a protected, warm, sunny site with well drained soil. With the exception of the perennial varietals they are generally treated as annuals and propagated from seed. Do not plant seed directly into the garden until the soil warms. For an early start, plant into seed trays kept in a warm and protected environment. Grow seedlings of smaller varieties in pots or spaced about 30cm apart. Larger bush types need spacing of about 45cm. Basil cross very readily between varieties. Water the basil regularly. 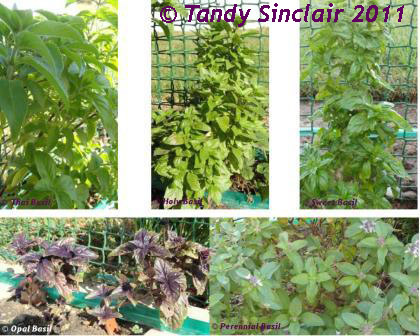 Basil grows rapidly at temperatures in excess of 16°C and is frost sensitive. Pinch out flower heads to promote bushy plant growth and to prolong the plant’s reproductive life. As a flavour boost, add to the coals of your barbeque. For companion planting, plant next to your tomatoes. Harvest the mature leaves for fresh use as you need them. To dry the leaves, cut bushes at the base and hang out of direct light, then store in an airtight container in a cool place. Basil is one of the great culinary herbs; different varieties are used extensively in both European and Asian cooking. Fresh sweet basil is highly aromatic, with a distinctive scent and flavour reminiscent of aniseed. Using a knife to cut basil can bruise and darken the leaves. For salads and pasta sauces shred the leaves with your fingers. Young leaves have the best flavour, while older ones have a coarser, stronger taste. In cooked dishes basil quickly loses its aroma and the leaves tend to darken. Add at the beginning of the cooking process to give depth of flavour and for fragrance and visual appeal, stir in a little bit more just before serving. Tomato dishes, chicken, egg and rice dishes, spaghetti sauces, fish and vegetables all go well with basil. The most famous use of basil is the Italian Pesto or French Pistou. Citrus scented and spice flavoured basil work well in a range of Asian recipes. One of my favorites especially paired with tomato. Are all the basil in the pic yours? I had the most fantastic perennial basil in digs that really did well – all the neighbors used to raid it! If memory serves, basil is your favourite herb. Where is that in your garden, I didn’t see it? good morning! I have a lovely herb garden the other side of the garage – between the street and the bunk beds!